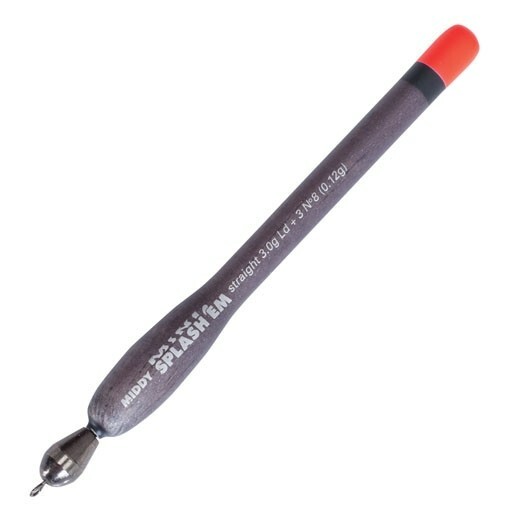 The straight-top Splash 'Em floats have just 9mm and 10mm diameter tips, making them useable where fisheries have banned the boulb type style. The straight top will also allow for situations where the carp are not in a total feeding frenzy because they register more sensitive bites. Made in the UK using A-grade soft balsa, these floats are black brass loaded and have a screw-in interchangeable swivel eye. Available in 6g and 8g. FREE Delivery on all Middy Floats / Markers / Spods over £100!! !